Although Pearl Jam bassist Jeff Ament made some impressive songwriting contributions to the band - Nothing As It Seems, Jeremy etc - it turns out Ament didn't solicit all his creations to Eddie Vedder and co. Jeff has taken 10 years worth of potential Pearl Jam tunes, chosen 10 of the best and is releasing his first solo record: Tone. Jeff explained that sometimes creative minds need a clear-out: "It just got to a point where I had to clean off the shelf a little bit," he told Billboard.com. "One Tone track, The Forest, was actually put to tape by Pearl Jam but Ed [Vedder] never got around to recording vocals for it. So I just wound up using the original version with a drum machine". 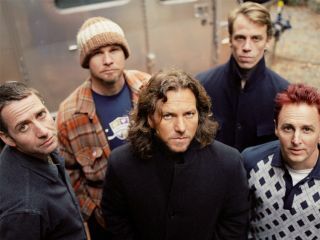 The project follows news of Pearl Jam drummer Matt Cameron's 'jazz inspired' band Harrybu McCage. The rest of Pearl Jam seem to be taking their sweet time to get back in the studio with producer Brendan O'Brien, so Tone might fill the void in the meantime. Tone will be released on 16 September but don't hang about - it's limited to 3000 CD copies. Ament's collaborator Richard Stuverud plays drums on six tracks while King's X frontman Doug Pinnick sings lead on Doubting Thomasina. Everything else is Ament.